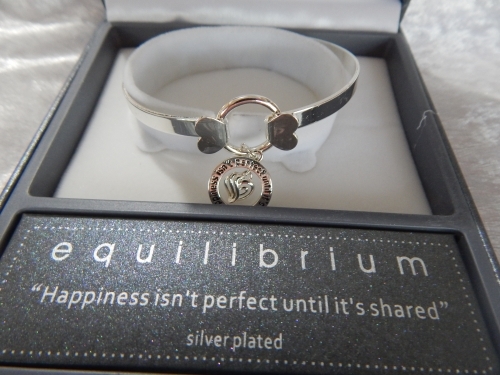 Equilibrium bangle inspirational charm with diamantes. The bangle measures 6.2cm inside and 0.5cm wide and is an abstract oval. An abstract oval is not a perfect oval. The front of the bangle is the clasp and in the middle of the round charm is another charm of 3 hearts entwined. 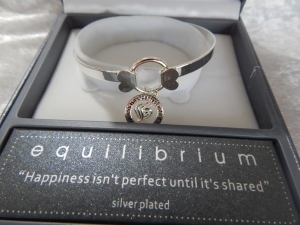 The message is engraved around the circle charm and reads "Happiness isn't perfect until it's shared". This bangle is in it's own jewellery box. Clearance item, once sold this will not be replaced. Sale Price: $21.20 You Save: $17.75 (45.57%)!